Welcome to October! Cooler in temperatures, perfect sweater weather, the leaves really reflect the autumn colors and of course it's Breast Cancer Awareness Month. What better way to lace up for the cure and catch the light at night than with the New Balance Pink Ribbon 990v4 for Breast Cancer Awareness. This lightweight sneaker, from New Balance's Lace Up for the Cure® collection, features a pigskin leather and mesh upper, while a combo of premium cushioning and stability deliver the feel that keeps you coming back. While the overall style remains as classic as the original, there are some subtle updates for this 4th generation: it’s more breathable, boasts a lace keeper to keep the tongue in place, and a new streamlined “N” logo. Other features include dual density collar foam, Encap PU ring with EVA (Ethyl Vinyl Acetate) core, and a ENCAP® midsole technology provides support and maximum durability. 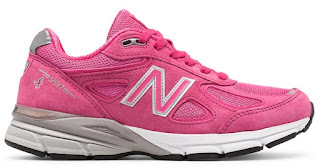 As in previous years, New Balance will contribute 5% of the retail price of the Pink Ribbon 990v4 sold from New Balance’s Lace Up for the Cure® Collection to Susan G. Komen, with a guaranteed minimum donation of $500,000. Grab them in Komen Pink for $164.99 on www.newbalance.com.